THIS ITEM IS NOT AVAILABLE AT PRESENT. 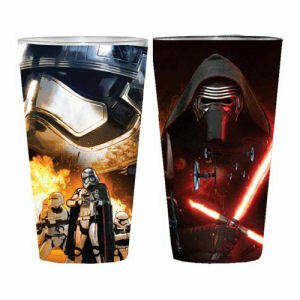 WE WILL NOT BE GETTING ANYMORE Star Wars Episode VII The Force Awakens Villain Poster Clear Full Wrap Pint Glass 2-Pack. From the Star Wars collection by Silver Buffalo. Star Wars Episode VII The Force Awakens Villain Poster Clear Full Wrap Pint Glass 2-Pack. Each glass measures 6 inches tall and holds 16 ounces. Hand wash only. Not dishwasher safe.